Interpretive Center hours: Wednesday-Sunday 10 AM-5 PM Come see the display of the Giant Ground Sloth replica, wildlife exhibits, live reptiles and birding station. Programs listed below meet promptly at the Interpretive Center unless otherwise noted. 2:00PM Leaping Lizards: Watch lizards leap at their lunch and toads lick their chops during our feeding show. 4:00PM Sandpiper Trail Nature Hike: Join the naturalist as you hike through salt marsh and maritime forest discussing the local area’s interesting history and wildlife. FOR MORE FREE SEPTEMBER KIDS EVENTS AT THE PARK, CLICK HERE. The independent private school on Wilmington Island is hosting a College Information Night on Thursday, September 13 at 7 p.m. on the Savannah campus. Admission representatives from Swarthmore College, Vassar College, Williams College and Wesleyan University will be on hand. These individuals will answer questions about the selective college admission process, essay writing, interviews, financial aid and scholarships. The event is free and open to the public. No reservations are required. Wee Ones Consignment Event in Rincon is growing into a NEW, larger location and welcomes you to consign with them! Public sale is 11am-6pm Sept. 13 and 14; 10 AM-2 PM Sept. 15 with most items 1/2 price. Wee Ones is a seasonal consignment event taking place twice a year. Wee Ones offers a friendly, clean, organized store where you can shop for children’s items. They specialize in upscale, boutique quality gently loved clothing sizes newborn-12/14, shoes, toys, equipment, books & a nice selection of NEW smocked apparel and hairbows at an affordable price! If you consign with Wee Ones, you will make 70% profit and also have the special opportunity to SHOP first. To find out how to prepare your items for sale & to learn more about becoming a consignor, click here or email weeonessale@windstream.net . 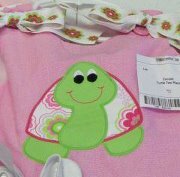 Wee Ones has a simple online tagging system to make consigning easy! Also, Wee Ones offers moms who own small business’s the opportunity to advertise! For $20, you can advertise your business in our goody bags that Wee Ones gives away to shoppers and hang your poster size advertisement in their store. Expose your business to lots of mommies from Rincon, Springfield, Guyton & all the Savannah area! Email Wee Ones for details at weeonessale@windstream.net . Limited space available, email today. Thanks for supporting Wee Ones as they head into their 6th consignment event. Wee Ones will accept CASH, Credit & Debit cards. Due to fees there will be a $20 purchase min. to use a credit or debit card (Visa, Mastercard & Discover). Wee Ones Consignment Event, GLOW Ministry Building OFF of GOSHEN Rd. (1.5 miles from previous location/HWY 21 & Goshen); next to GRACE Community Church, behind the soceer fields on Goshen Rd. Just minutes from I-95, exit 109. For directions, click here or email weeonessale@windstream.net Wee Ones is a SouthernMamas advertiser. Lovin’ Spoons self-serve froyo is the place to savor the last bit of summer & save this Labor Day Weekend. That’s because Lovin’ Spoons is offering some fun 2012 Labor Day Weekend specials at all 4 Lovin’ Spoons self-froyo stores. *Sat/Sun/Mon (Sept 1-3) First 15 customers get a free Lovin’ visor. Lovin’ Spoons opens at 11am each day, Sunday at noon. *Sat/Sun/Mon (Sept 1-3) Lovin’ Spoons is Doubling Down with their word of the day: Say “Double Down!” all weekend long for 20% off your yogurt. * Sun/Mon (Sept 2-3) 1-3pm, it’s $5 all you can eat in one cup! All specials good at all 4 stores, Savannah, Pooler, Richmond Hill and Bluffton! Lovin’ Spoons FroYo offers 12 ever changing flavors, over 40 fresh toppings, hot syrups served up with a groovy 70s vibe. A popular Toddler Tuesday weekly nature program at Oatland Island Wildlife Center in Savannah. There will be no Toddler Tuesday on April 9 2013 but click here to see the theme for Tuesday April 16. At Toddler Tuesday, children & their parents/caretakers experience nature through themed activities including live animal encounters, wildlife nature walks, storytelling, songs, interactive finger-play & crafts. We’re thrilled to learn that the popular Toddler Tuesday weekly nature program at Oatland Island Wildlife Center in Savannah will resume after a summer hiatus. The first Toddler Tuesday of the 2012-13 season will be Tues. Sept. 4. Theme is “School is for Fish”. Oatland’s new naturalist Michelle Kelly will lead the sessions. Pre-registration required. Toddler Tuesday Program Fees for 2011-2012: General: $5 per child $5 per adult Friends of Oatland Members: $5 per child, up to 2 adults FREE! Program fee includes program and entrance to Oatland Island Wildlife Center and trails. 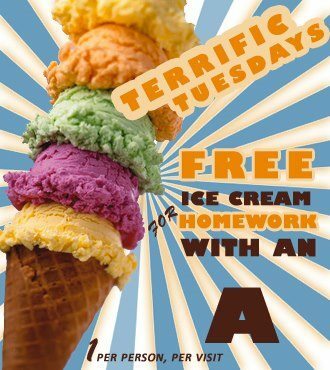 On Tuesdays, Jump N’ Jacks indoor play center in Richmond Hill offers a free ice cream cone for kids that bring in a homework assignment with an “A” grade. Children are naturally drawn to music. By engaging your children in music classes you are not only giving them a “leg-up” on their musical development but on all other educational pursuits as well. The Coastal Orff Academy is now accepting students age 9-12 for group music classes. In game-like atmosphere students explore and learn music fundamentals by playing, singing, and moving. Everyone is welcome and no prior music knowledge is required. Get expert advice in choosing the right band instrument. Musikgarten offers parent-and-child classes @ Georgia Music Warehouse, 2424 Abercorn St, Savannah, 31401. (Rear Lot entrance) FREE Preview classes. More info here. Musikgarten is a SouthernMamas.com advertiser. Balloon artist Lynnae Weller, owner of Bend Out A Shape Balloons, needs your help searching for clues in a series of strange events as you travel together through well-loved children’s books such as “Sheep in a Jeep” by Nancy Shaw; “Llama, Llama, Red Pajama” by Anna Dewdney; and “Goodnight Moon” by Margaret Wise Brown. Ages 3 and up. 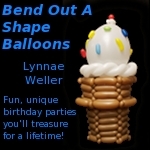 Lynnae Weller, owner of Bend Out A Shape Balloons, has been doing children’s birthday parties for over 6 years with many happy clients. Birthday party package: Each birthday child gets a large, unique balloon sculpture that is tailored to your theme. Every child at the party will get the chance to “Stump the Balloon Artist” by requesting their own individual creation. There are always plenty of games and fun with a party from Bend Out A Shape Balloons. Like Bend Out A Shape Balloons on Facebook here. Bend Out A Shape Balloons at 912-228-3024 or e-mail bendoutashape@gmail.com, www.bendoutashape.com/ Bend Out A Shape Balloons is a SouthernMamas.com advertiser. Stroller Strides® of Savannah is a total fitness program that moms can do with their babies. Classes include power walking and intervals of strength training. Classes are designed for all moms with any level of exercise. Certified instructors will guide you through exercises that will strengthen your bodies and give you the energy you need for the awesome gift of motherhood. Classes are 8 AM Tuesdays & Thursdays at Lake Mayer. The first class is free and Stroller Strides of Savannah will offer a special discount if you mention you heard about Stroller Strides of Savannah on SouthernMamas.com! Register for your free class by clicking here and see all the different class packages offered, by clicking on the “More Info” button in one of the class boxes on the left. You can sign up for any class package when you show up for class, with your instructor. What if my baby is fussy? Stroller Strides of Savannah welcomes babies from 6 weeks to any age. Babies are Stroller Strides’ priority, so don’t worry if yours is fussy! What should I wear to class ? Wear something comfortable that you can move ( power walk,jog, stretch) easily in. Please make sure that you have comfortable tennis shoes on. Please arrive 10 to 15 minutes early to class so you don’t get left behind. Stay connected with Stroller Strides Savannah and learn about new classes & updates by liking them on Facebook here. Stroller Strides of Savannah, contact Natalia Lucero at (910) 987-5943, email natalialucero@strollerstrides.net , http://classes.strollerstrides.net/savannah/location/index.aspx Stroller Strides of Savannah is a SouthernMamas.com advertiser. What should I wear to class ? Wear something comfortable that you can move ( power walk,jog, stretch) easily in. Please make sure that you have comfortable tennis shoes on. 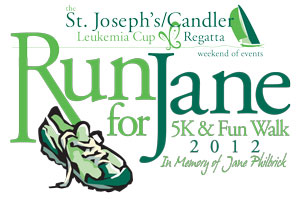 Plan to take part in The Leukemia Cup “Run for Jane,” a 5K Run/Walk and FREE Kids Run held in conjunction with the 2012 St. Joseph’s/Candler Leukemia Cup Regatta Weekend of Events. This run is the only Savannah run that takes place in a National Park. It is named in honor of Dr. Jane Philbrick, who is well described by Mr. Paul Hinchey as being a, “very well known educator here in Savannah and a strong community supporter. She was a remarkable person, a consummate professional and had a heart of gold.” The Leukemia Cup is a community coming together through a series of sporting events to help fight leukemia, lymphoma, and other blood cancers, coordinated by the members of the Savannah Yacht Club. The Leukemia Cup Includes: 5K Run / Walk, golf, junior fishing, in-shore fishing, tennis, sailing, clay shoot, black-tie dinner & auction and a Luau for Leukemia. In 1997,The Leukemia Cup began as a Sailing Regatta and has since emerged as a premier series of sporting events benefiting the mission of The Leukemia & Lymphoma Society. LEGO Day at The Sandbox Interactive Children’s Museum, Hilton Head Is. You’re invited to LEGO Day- Read! Play! Build! on Sat. Sept. 1, from 11 am to 3 pm at The Sandbox Interactive Children’s Museum on Hilton Head Is. Kids can play with all kinds of LEGOs to spark the imagination and creativity in children and bring a fun and interactive story time to children in our area. LEGO DUPLO blocks are perfect for young children between the ages of 2 through 6 years to build creative minds, inspire true imagination, and foster early child literacy. “LEGO Playmasters” will run games, activities, and even a story time for all of the attendees. Read! Play! Build! is made possible by LEGO DUPLO and ALSC (Association of Library Services to Children). Activities are designed for parents and caregivers to interact and assist their child with the LEGO projects and to stay and enjoy all of the museum’s exhibits and activities. The LEGO program cost is $5 per person (under 1 is free) and includes museum admission fee. Posted in Uncategorized | Comments Off on LEGO Day at The Sandbox Interactive Children’s Museum, Hilton Head Is. Live music and fireworks from the Tybee Pier & Pavilion at the Fifth Annual Tybee Island Labor Day Beach Bash featuring free live entertainment by the Swingin’ Medallions. The Labor Day Beach Bash fireworks display can be seen from the pier, the beach or anywhere on Tybee Island after dark (around 9:15 p.m.).